The double base shall be used at first base. 1. A batted ball hitting or bounding over the white portion is fair. 2. A batted ball hitting or bounding over the orange portion is foul. 3. When a play is being made on the batter-runner the defense must use the white portion and the batter-runner the orange color portion of the base. EFFECT: The batter-runner is out when there is a play being made at first base and the batter-runner touches only the white portion, providing the defense appeals prior to the batter-runner returning to first base. Once the runner returns to the white or orange color portion of the base, an appeal shall not be honored. 4. On any force out attempt from the foul side of first base the defense and the batter-runer may use either the white or orange color portion of the base. 5. On an errant throw pulling the defense off the white portion of the base into foul ground, the defense and the batter-runner can use either the white or orange color portion. 6. Once the batter-runner reaches frist base, they may start on either the white or orange color portion of the entire base. 7. On balls hit to the outfield with no play on the batter-runner advancing to first base, the batter-runner may touch the white or orange color portion. Should the batter-runner return, the runner and defense can use the white or orange color portion. 8. When tagging up on a fly ball the white or orange color portion of the base may be used. On an appeal for the runner leaving the base too soon, the defense may use the white or orange color of the base. 9. With stealing, on an attempted pick-off play, the runner may return to the white or orange color portion of the base. 10. On plays at 1B when the batter-runner touches only the white portion and collides with the fielder about to catch a thrown ball while on the white portion of the base. EFFECT: Interference, the ball is dead, the batter-runner is out and runners must return to the last base occupied at the time of interference. A strike occurs when the ball lands on home plate or the mat as long as the arc of the ball is 6′-12′. 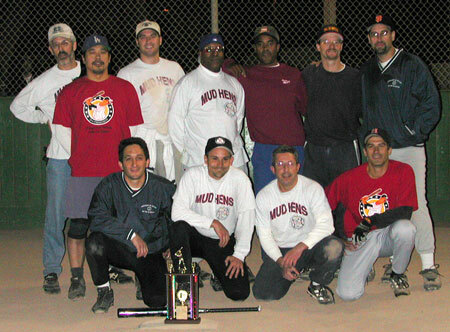 Slow Pitch: A team may legally begin a game with 9 players. A player arriving after the official start of the game may be added to the line-up at anytime, if the line-up has less than ten (10) players. That player must be listed at the bottom of the line-up. A team starting with 10, 11, or 12 players may finish a game with 9 players if players were lost due to injury or ejection and no substitute is available. If such a player is a batter, the next hitter in the lineup will assume the ball/strike count and finish the turn at bat. If such a player is a runner, he/she is declared out and the game continues. COED: A team can start with 9 players, using the short-handed rule (the vacated position would be an out ). A player arriving after the official start of the game may be added to the line-up at anytime, if the line-up has less than ten (10) players. That player must be listed at the bottom of the line-up. If using 10 players, there must be 5 male and 5 female players. If using Extra Players (EP’s), 12 players(6 male & 6 female) must start the game. If a Coed team loses a player (playing with 12 players then to 11 players) due to injury or ejection and no substitute is available, the following player in the batting order must be removed from the line-up. This player cannot re-enter in the batting order, but may still play defense. A Coed team may finish a game with 9 players, if players are lost due to injury or ejection and no substitute is available. The vacated spot would be an automatic out every time in the batting order. MODIFIED COED: A team consists of 10 players, 6 men and 4 women. However, a team may begin with a minimum of 9 players, of which there is 6 men and 3 women; or 5 men and 4 women. If a team starts with 9 players and a player arrives late, that player may enter the game immediately, in the last spot in the batting order. Until the last player shows up the missing spot in the order will be an out. A team may not bat 3 males consecutively. When a teams starts “shorthanded”, with only 9 players, the manager or team captain needs to make sure that they do not have 3 males batting consecutively (in the 8th, 9th & 10th spots) when the 10th player shows up and is put in the last spot of the batting order. NOTE: Teams cannot agree to play with less than the above stated number of players. Team membership consists of persons whose names, home addresses and phone numbers appear on the Official Team Roster as approved by the League Office. League schedules can be found on our website at sfsoftball.com. RANDOM ROSTER CHECKS MAY BE MADE AT ANYTIME DURING LEAGUE, PLAYOFF, AND/OR CHAMPIONSHIP GAMES. PLAYERS MAY PARTICIPATE FOR TWO TEAMS (NOT IN THE SAME CLASSIFICATION). E.G. : Can play in Open and Coed, or Coed and Seniors, but not Coed and Coed or Open and Open. Any player who participates for more than two (2) teams is ineligible and will be suspended from further League play. Any team using an ineligible player is subject to forfeiture of the game. The Manager (or team representative, if mgr is not present) is responsible for and must sign the lineup card. This signature affirms that only roster members legally entitled to play will participate in the game. If, in the investigation of a roster, it is found that a team has used an ineligible player, the team manager is automatically suspended for 4 games (including playoffs) and that game is forfeited. All additions and deletions may be made up to mid-season. NOTE: ANY PLAYER ALREADY LISTED ON A TEAM ROSTER MID-SEASON , CANNOT BE ADDED TO ANY OTHER ROSTER. Requests to adjust rosters after this deadline must be based upon the following circumstances: 1. Injury 2. Military Transfer 3. Job transfer out of the Bay Area and approved by the league office. Requests must be submitted to the League Office in writing with documentation. Final decision on all roster changes will be made by the League Office. Any change that affects a team’s classification or increases the number of non-residents will not be allowed. NO CHANGES CAN BE MADE AFTER THE REGULAR SEASON. Only managers should phone the League Office at 831-6316 to check if a game is questionable. Managers and players can also check the field conditions by going to our web site at www.sfsoftball.com. PLEASE DO NOT CALL BEFORE 3:30 P.M. DO NOT ASSUME A GAME IS CALLED OFF UNTIL DECLARED BY THE LEAGUE OFFICE! If at game time it is raining or field is wet, umpires will determine if a game should start or continue, if in progress. The League Office will provide an Official Score sheet for each game and it shall be kept by the home team’s scorekeeper. If the home team does not have a scorekeeper, the visiting team keeps score. NO CHANGE IN HOME TEAM STATUS WILL BE MADE. If neither team has a scorekeeper, both teams shall keep score, alternating during their times at bat. Failure to properly keep score is subject to action by the League Office (forfeiture or double forfeiture) at its discretion. The Official Score Sheet must be returned to the Umpire at the conclusion of the game by the team keeping score; said team may keep the duplicate copy. All participating players must be announced to the scorekeeper and listed on the Official Score sheet, as well as reported to the plate umpire. It is strongly recommended that each team also keep its own scorebook. Each team must fill out information (players’ last names and positions) as requested on lineup card before game time. The lineup card is signed by the manager who by signing this card is stating all information on the card is true. Any manager falsifying names on the lineup card is subject to a 4-game suspension. Lineup cards must be presented when called for by the Plate Umpire or the game may be forfeited. The umpire will keep the hard copy and will give the original one to the opposing teams. Additional cards may be secured from the director of the unit or the League Office. All players listed must be present when the lineup cards are exchanged. Note: After the lineup cards are exchanged, any player listed thereon and not present shall be scratched when discovered. If applicable, the “Batting Out of Order Rule” shall apply when the infraction is discovered. Note: If an unannounced substitute or illegal player participates in the game and is subsequently discovered and disqualified, this disqualification shall not cause the disqualification of any other team member. The League Office has contracted with the Northern California Umpire’s Association to provide two umpires for all games. a) The League Office will not recognize any League game played without an assigned league umpire. If no umpires show up for a game, the game will be rescheduled by the League Office. b) If only one umpire has arrived by game time, that umpire will conduct the game. Teams involved must call the league office to be compensated with a refund at the conclusion of the league. All games must be played as scheduled. There will not be any time allowed for late arrivals or warm-ups. Teams must be on the field ready to play at game time. The time limit shall be announced to each team manager or captain by the umpire when lineup cards are exchanged during the pre-game managers meeting. PLAYING TIME BEGINS WHEN LINE-UP CARDS ARE TORN AT THE CONCLUSION OF THE PRE-GAME CONFERENCE. All Slow Pitch Games will be allowed one (1) hour and ten (10) minutes of playing time. While an Official Game shall consist of seven (7) innings, the one (1) hour and ten (10) minute rule shall predominate and allow an official game to consist of less than seven (7) innings. A new inning (including an extra inning if the score is tied after seven innings) only begins if at the instant the final out of the previous inning is recorded the time limit has not been reached. The Run Ahead Rule NOW CHANGED EFFECTIVE March 15, 2012. Slow Pitch: 20 runs at 1 hour drop dead time. Any game not able to start as scheduled due to carry-over from an earlier game will still play the allotted time. No new inning will start after 10:10 p.m. Game will be suspended and completed at the end of the season if playoff implications are involved. NOTE: Slow Pitch playoff games will use a one (1) hour twenty (20) minute limit. (If tied, tie-breakers and playoff games will continue to a winner.) Championship games will have no time limit; however, the Run Ahead Rule is still in effect. In any situation where play is suspended for more than five (5) minutes due to injury or field conditions, the time limit shall be extended to eliminate the full amount of time lost. In this event, the Plate Umpire shall announce the new time limit before resuming play. In any situation where play of a game is interrupted for longer than twenty minutes, the game will be suspended. This suspension policy is applicable only if another league game follows the suspended game. A suspended game will be replayed from the point of suspension and rescheduled by the League Office. ASA Rule 4, Section 4. One or two extra players may be designated at any place in the batting order. The EP(s) may enter a game on defense at any time, but the batting order must remain the same throughout the game. A team using an “EP” or 2 “EP’s” may finish the game with 9,10 or 11 players if players are lost due to injury or ejection and no substitutes are available. Also see page #5 – Coed Rules, #10.D and page #6 – Modified Coed Rules, #11.B. A. Only one Courtesy Runner is permitted per inning, if using the Courtesy Runner rule. D. If there are no players in the lineup that have completed their turn at bat yet (first inning only), and batter or batters reach safely then the courtesy runner will be the last batter in the lineup. Any exception will revert to “B”. 8. PITCHING – An arc of 6′ – 12′ will continued to be used for all Slow Pitch games. A. Line Up: A team can use 9 players (5 male and 4 female or vice versa) to start a game. A team may also finish a game with 9 players if players are lost due to injury or ejection and no substitute is available. The vacated spot would be an automatic out ever time in the batting order. If the 10th player arrived after the start of the game, they could be entered into the vacated spot, which could be either the 9th or 10th place in the batting order, depending on the gender of player who started the game batting last. B. At Bat: Male and female players must alternate in the batting order. When there is a walk to a male batter, he will be placed on second base. With one or no outs, the female who follows in the batting order must bat. With two outs, the female has the option to walk or bat. Note: Should the female batter-runner pass a male batter runner when choosing to walk, no out shall be called during this dead ball period. A male batter runner advancing to second without touching first base shall be called out if properly appealed. C. In the Field: If playing with10 players, a team must have an equal amount of males and females in both the infield and outfield. Example: 2 males and 2 females in the infield, 1 male and 1 female as catcher or pitcher and 2 males and 2 females in the outfield. D. Extra Players: Extra players (EP) may be used in Coed. If the “EP” is used, 12 players must be used (6 males and 6 females) from the start to the finish of the game. All 12 players must bat and any 10 (5 males and 5 females) may play defense. Defensive positions may be changed as long as they Correspond to Rule C above. The batting order must remain the same throughout the game. EXCEPTION: A team may drop from 12 to 11 players if a player is lost due to injury or rejection and no substitute is available. The game may continue by removing the player next in the batting order. The player cannot re-enter in the batting order but can still play defense. involving the incorrect pitched softball will be void. Play will resume with the proper softball. F. Sliding is allowed in Coed. A. Line up: A TEAM CONSISTS OF 10 PLAYERS, 6 MEN AND 4 WOMEN. However, a team may begin with a minimum of 9 players, of which 3 must be women. 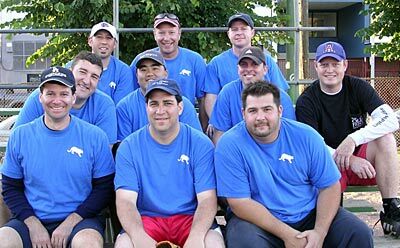 If a team starts with 9 players and a player arrives late, that player may enter the game immediately and put into the last spot of the batting order. Until the last player shows up the missing spot in the order will be an out. A team may not bat 3 males consecutively. When a teams starts “shorthanded”, with only 9 players, the manager or team captain needs to make sure that they do not have 3 males batting consecutively (in the 8th, 9th & 10th spots) when the 10th player shows up and is put in the last spot of the batting order. Note: Modified Co-Ed Line-up cards must have indication of “M” (male) or “F” (female) listed next to each player’s name. B. Extra Player: If using Extra Players (EP’s), 12 players (7 male and 5 female) must start the game. 1. The batter begins each plate appearance with the count of one (1) ball and one (1) strike. 2. The batter is allowed one (1) free foul ball after the second strike. 3. You cannot bat three males in a row. 4. If a male batter walks in front of another male he gets 1st base. 5. If a male walks in front of a female batter he gets 2nd base. D. In the Field: Teams must have at least 1 female in the infield and outfield, and 1 male and 1 female as pitcher and catcher. Lang #1, Lang #2, Rolph #1, Rolph #2, and Jackson #1 diamonds. B. Each successive fair ball that goes over the fence on a fly will be ruled an out. 1. First Place Team trophy for Champions of each classification. 2. Individual Player awards will be awarded to First and Second Place winners. TWO (2) points for a win; ONE (1) point for a tie; ZERO (0) points for a loss. Tiebreaker for playoffs spots where records are equal: Head to head results, then if needed run differential between the teams involved, If still tied then total run differential of season will be used to break ties for playoff positions. Two teams that have not played each other during league play and whose records are equal, playoff positions will be determined by overall run differential. Playoffs will be held to determine the champion and runners-up of each classification. Teams with a record of 8-0 and/or 7-1 in all three season’s in one year or two of these and also participating in the Championship Game(s) during the same year, may be moved up to the next level. A. If either team does not have at least nine (9) players to legally begin, a grace period of 15 minutes will be allowed. Exception: If a game has not ended, but the time limit has expired and surpassed the next game’s starting time by fifteen (15) minutes, there will not be a grace period for the next game. If the game surpassed only by five (5) minutes, then there will be a five (10) minute grace, etc., etc. B. The grace period when utilized will be part of the 1:10 minute game time / 1:30 minute for Fast Pitch. 1. GAME CHANGE REQUESTS: There is a $75 fee for any game change request that is granted. The fee must be paid before the game is changed. 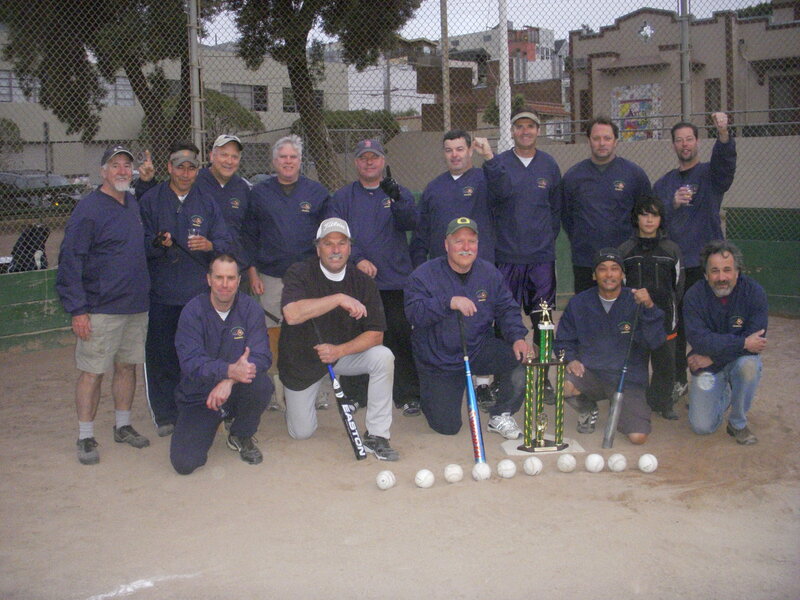 The Manager of the requesting team must first call the league office 415 831-6316 to see if a game change is possible. If the office approves the game change, the requesting manager must then call the manager of the team they are scheduled to play to see if they approve of the change. If they do approve, they must call the league office to give their approval. ANY TEAM contacting the league office and the opposing manager 24 hours in advance of their scheduled game to report their forfeit will not be charged a forfeit fee. ANY TEAM FORFEITING A LEAGUE GAME WITH LESS THAN 24 HOUR NOTICE WILL BE SUSPENDED FROM FURTHER PLAY UNTIL A $50.00 FEE IS PAID. Payment may be paid by calling the league office at 415 831-6316. If payment is not received before the next scheduled game, the forfeiting team may be dropped from the League. All forfeit fees must be paid by Credit Card: VISA, Mastercard or Discover Card. C. the manager is responsible for fees owed and cannot participate until all fees are paid. ANYONE EJECTED FROM A GAME FOR UNSPORTSMANLIKE CONDUCT OR DEMONSTRATING UNSPORTSMANLIKE CONDUCT TOWARDS AN UMPIRE AFTER A GAME HAS ENDED IS AT A MINIMUM, AUTOMATICALLY SUSPENDED FROM THEIR TEAM’S NEXT SCHEDULED LEAGUE GAME. FAILURE TO SIT OUT SUSPENSION WILL RESULT IN A FORFEITURE OF THE GAME. EJECTED PARTICIPANTS MUST LEAVE THE GROUNDS.FAILURE TO DO SO OR RETURNING AFTER THE CONTEST AND CONTINUING THEIR POOR CONDUCT COULD RESULT IN A MINIMUM OF A FOUR GAME SUSPENSION. MANAGERS ARE RESPONSIBLE FOR FINDING OUT THE LENGTH OF THE SUSPENSION. ANY MANAGER WHO PLAYS A SUSPENDED PLAYER WILL BE SUBJECT TO A FOUR GAME SUSPENSION FOR DOING SO. 4. PROTESTS: There shall be no protest involving a decision based upon the judgment of an umpire. Please check your Rule Book for proper protest procedures. A. Only the manager may notify the Plate Umpire of his/her intent to play the game under protest. The notification of intent to protest must be made to the Plate Umpire immediately – before the next pitch. Be sure the Plate Umpire has noted your intent to Protest on the lineup card and the score book and informed the manager of the other team before continuing play. B. Any player who is challenged on eligibility will be requested to show an I.D. to the umpire. If player does not have I.D., then he or she must give their home address to the umpire and sign the lineup card or game is forfeited. All identification is done by a California Driver’s License of California D.M.V.I.C. and signature. All information must match Official Rosters. C. After properly notifying the Plate Umpire, all protests (including player eligibility) must then be submitted in writing accompanied with a $50.00 protest fee by credit card and received by the League Office, within two (2) business days following the protested game; otherwise game will stand as played. Protests in tie-breaker and playoff games must be received prior to 5:00 p.m. on the first business day following the protested game. D. The protest fee will be returned if the protest is upheld. If denied, the fee will revert to the League Office. For any disagreement with the League Office’s decision on the outcome of a protest, the concerned team may appeal in writing to the League Office, accompanied with a $15.00 appeals fee. All appeals must be received by the League Office within three (3) business days of the postmarked date on the written decision. A Softball Appeals Committee will then be established to hear the appeal. 1. NO PLAYER SHALL: Refuse to abide by an official’s decision, threaten an official, or at any time lay a hand upon, push, shove, or strike an official. Player(s) in this code includes any participant i.e. player, squad member, coach, manager, scorekeeper and/or fan(s). 2. NO PLAYER SHALL: Demonstrate objection to an official’s decision be throwing any object, and no object shall be thrown in any manner, for any reason that an official judges to be dangerous. 6. NO PLAYER SHALL: Smoke while coming off or going onto the field of play or while on the field of play. 7. NO PLAYER SHALL: Permit anyone to remain in the team area during the game who is not a roster member of the team. Managers, scorekeepers, bat boys/bat girls are the exception. PENALTY: Official(s) shall notify a team’s manager if this rule is not complied with. Thereafter, failure to cooperate with official(s) in enforcing this rule shall result in forfeiture of the game. 8. LEAGUE OFFICE SHALL: Have the power and full discretion of imposing penalties on all violations of player’s code of conduct. For any violation not included in the said code, the penalty shall be at the discretion of the League Office. 9. GAME OFFICIALS (UMPIRES) SHALL: Have general authority to handle unsportsmanlike conduct in accordance with A.S.A. Rule 10, Section 9. 10. THE GAME OFFICIAL IN CHARGE SHALL: Either suspend or declare forfeit any game where in his/her judgment there has been a violation of this code that makes it unsafe to continue the contest. A. Use Profane, Indecent or Insulting Language. No person who is intoxicated, noisy, disorderly, boisterous, or publicly offensive, shall be admitted into or permitted to remain within any Park, Square, Grounds, or Recreation Facility: The person in charge shall refuse admittance to any such person and shall eject any such person there from. The use of intoxicating substance is prohibited. Any player found using or consuming any intoxicant before or during a game will be suspended and/or game forfeited. 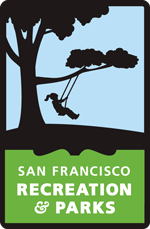 Players release the San Francisco Softball Association, City and County of San Francisco, and/or Director in charge, from all liabilities, claims, demands, debts and judgments. Teams must supply their own equipment, excluding bases. At game time, each manager must supply the Umpire with a brand new official game ball. (COED: two  brand new game balls – one  11 inch, one  12 inch). The team responsible for causing the ball to go out of play becomes responsible for retrieving or replacing it with another. Only OFFICIAL ASA softballs bearing this certification mark may be used in league games. Softballs must also meet the additional requirements, below. The optic yellow cover, red-stitch, and black indelible stamping as approved by ASA. The balls used are the 12-inch 52/300 and for women in Coed the 11-inch 44/375. D. Balls will be provided for playoff games only. Football cleats, track shoes or soccer cleats are not allowed. A Catcher’s Mask or Face Mask such as a Rip-It Mask or similar must be worn in all League games. Games will not be officiated if there is no mask available. If anchor bases cannot be safely attached, loose bases will be used. Silver Terrace Thornton Ave & Bayshore Blvd. 1. Provisions are in effect as of March 1, 2003. All previous ground rules are superseded. 2. Ground Rules established by the League and published for the current season shall always govern, whenever they apply to any specific situation. 3. It is League policy that these Ground Rules, including specific Ground Rules for each and every Playing Field, shall be posted in the Clubhouse/Office at all such locations used by the League. 4. Game umpires shall clarify these Ground Rules (including additional Ground Rules, if necessary) to both teams and their coaches, but nothing stated by the umpires before the game or ruled by the umpires during the game may legally conflict with these published Ground Rules or with any additions and/or changes authorized and published by the League. 5. Safety of participants is the primary consideration governing these published Ground Rules or with any additional Ground Rules which may be made at any location. 6. Any special Ground Rule addition to these Ground Rules Shall be announced before the game and also noted on the lineup card(s) turned in by the plate umpire, but failure to note said addition can not be protested. 7. Unless specifically stated otherwise as part of a particular Ground Rule, ASA Rules shall apply whenever a Ground Rule is invoked in any situation. 8. When a fly ball putout is clearly prevented by the interference of any non-participant (including a player in another game), an umpire may declare the batter out, in which event the ball is dead and bases may be awarded to other runners. All this is umpire judgment. Otherwise, there cannot be non-participant interference unless the act is judged intentional, in which event the ball is dead and the umpires shall decide the bases to be awarded. 9. When an outfielder believes a ball is “out of play”, said fielder should step away from the ball and raise his/her hands to signal the field umpire to come and make a ruling. Playing the ball will probably cause it to remain alive. All this is umpire judgment. 10. Whenever a tree or pole is located on and overhangs from foul ground, any batted ball touching said tree or pole within the field, if still in flight is a foul ball. Any other ball so touching remains alive and in play if it stays within the field. 11. Whenever a batted ball hits a tree or pole overhanging the field from behind an outfield fence: To award a home run, an umpire must judge the ball would have cleared the fence. Otherwise the ball remains alive and in play whenever it comes down within the field. and in play whenever it comes down within the field. 14. Balls lodging in trees are dead (and remains dead) when so declared by the umpire, and unless otherwise stated, ASA Rules apply. 15. Unless otherwise stated, all fences are per ASA Rules. Fair batted balls lodging in, rolling under, going through and/or bouncing over fences are ground rule doubles(i.e. two-base awards).16. If the plate umpire, at his/her discretion, decides it is necessary, he/she shall announce ground rules establishing “out of play” areas for earth mounds and/or similar areas.17. If the plate umpire, at his/her discretion, decides it is necessary, he/she shall announce ground rules establishing “out of play” areas for water hazards and/or similar areas.18. If a specific published Ground Rule for a particular Playing Field conflicts with these general provisions, said specific Ground Rule shall govern. PLAYING FIELD GROUND RULES: AN ASTERISK (*) INDICATES OUT OF PLAY (DEAD BALL AREA). APPLY ASA RULES UNLESS OTHERWISE INDICATED. The enclosed Playing Field which is nearest to the Clubhouse. Backstop: All areas are in play. Third Base Side: * Over an “out of play” line from the backstop directly to the far corner of the stands and then extending parallel to the foul line to the extension of the left field fence (Any ball hitting the Stands or the Light Tower Enclosure is therefore “out of play. Left field: * Through the gap between the outfield fence and the out of play line is a two-base award. Center field: All areas are in play. Right field: * Through the gap between the outfield fence and the out of play line is a two-base award. First Base Side: * Over an “out of play” line from the backstop directly to the far corner of the stands and then extending parallel to the foul line to the extension of the right field fence (Any ball hitting the Stands or the Light Tower Enclosure is therefore out of play). Overhanging Trees: see General Rules 10 and 11.Outfield Fences: see General Rule 15. The Playing Field near the Clubhouse. Jackson #1 field only. If a batted ball in flight goes into the children’s playground, the batter will be called out by the plate umpire. This affects only the children’s area. There is no penalty if the batted ball goes into the basketball court or the tennis court, only the children’s playground area is affected by this rule. If the batted ball hits the light pole and ricochets off into the children’s area, this will also result in the batter being called out. Third Base Side: * Through the Gate to the third base team area. There is no award if this Gate is left open by the offensive team. * Over an out-of-play line from the third base fence diagonal to and around the light tower behind third base (this Light Tower is therefore out-of-play)Left field: All areas are in play. Right field: * Into the Stairwell in right-center field. A fly ball is a four base award. On a bounce or roll, this is a two base award. * A ball remaining behind the adjacent Valve Box in right-center field. This is a two-base award. The Playing Field away from the Clubhouse. Third Base Side: * Through the Gate into the third base team area. There is no award if this Gate is left open by the offensive team. * Over an out-of-play line from the third base fence diagonal to and around the Light Tower behind third base (this Light Tower is therefore out-of-play). Left field: *Into the Stairwell and the area behind the adjacent Valve Box. Both are on foul ground and out-of-play. Right field: * The asphalt Driveway and Bench beyond Driveway. Both are on foul ground and out-of-play. All outfield grass is in play. First base side: *Through the gate into the first base team area. There is no award if this gate is left open by the offensive team. *Over an out-of-play line from the first base fence diagonal to and around the Light Tower behind first base (this Light Tower is therefore out-of-play). Replaces previous line that included dirt between first base fence and outfield grass. Overhanging Trees: see General Rules 10 and 11. Trees within the Field: see General Rule 12. The Playing Field with the permanent concrete stands, located North from the Clubhouse. Third Base Side: * Through the Gate into the third base team area. There is no award if this gate is left open by the offensive team. Left field: *Any fair batted ball into Lacrosse or Soccer goals. A fly ball on top of the Shed is a home run. (The face of the Shed is live and in play). Center field: *Onto or behind the Bench and Concrete Pad is a four-base award. Right field: *Any fair batted ball into Lacrosse or Soccer goals is a four-base award. First Base Side: * Through the Gate into the first base team area. There is no award if this gate is left open by offensive team. * Through the gate behind first base and in front of the clubhouse. The Playing Field with the permanent metal stands. Ellis & Steiner St.
Third base side: *Into third base team area or stands. Any fair batted ball into Lacrosse and/or Soccer goals along third base side is a two-base award. (A fair batted ball striking and rebounding off the Soccer post/frame is live and in play). Left field: *Any fair batted ball into Lacrosse or Soccer goals in front of Clubhouse is a four-base award. Right field: *Any fair batted ball into Lacrosse or Soccer goals beyond Kimball #1 third base foul line is a four-base award. First base side: *Into the first base side team area or stands or onto the Bench and Concrete Pad area. The Playing Field near the Clubhouse on Turk St.
Third Base Side: * Through the opening between the backstop and third base team area. * Into the third base team area. * Into the area from the end of the third base fence with an imaginary diagonal line towards the first light tower at the Turk Street fence. Left field: All areas are in play. Center field: *Through either opening between the backstop and the team area on Lang #2 is a four-base award. (All areas within the Playing Field on Lang #2 are in play). Right field: * Over the right field fence: A fair fly over this fence to the right of the Light Tower is two-bases in Open Slow Pitch and for a male in Coed Slow Pitch. In Women’s Slow Pitch this is a home run. (A ball hitting the Light Tower is a home run. First Base Side: * Over an out-of-play line from the end of the first base fence to the outfield grass and 90 degrees along the back of the Asphalt Area to the Driveway Fence. The dirt behind this line is out-of-play. All the outfield grass is in play. Overhanging Trees: see General Rules 10 and 11. The Playing Field away from the Clubhouse. Gough & Golden Gate Ave.
Third Base Side: * Through the opening between the backstop and third base team area. * Into the third base team area. * Into the area from the end of the third base fence with an imaginary diagonal line towards the first light tower at the Golden Gate Avenue fence. Center field: Through either opening between the backstop and the team area on Lang #1 is a four-base award. (All areas within the Playing Field on Lang #1 are in play). Right field: * Over the right field fence: A fair fly over this fence to the right of the Light Tower is a two-base award in Open Slow Pitch and for a Male in Coed Slow Pitch. In Women’s Slow Pitch this is a home run. *Into the Mulch Area surrounding the Tree to the right of the foul line. First Base Side: *Over an out-of-play line from the first base fence diagonal to the first Light Tower behind first base (this Light Tower is therefore out-of-play). Overhanging Trees: see General Rules 10 and 11. Moscone #1 The Playing Field diagonally across from the baseball field. Chestnut and Laguna St.
Third Base Side: * Over an out-of-play line from the backstop fence in front of the bleachers to the Handrail furthest from the foul line. *The Walkway in front of and including the Clubhouse Steps. Left field: Any fair batted ball into the Flower Bed along the Clubhouse wall, All outfield grass is in play. Right field: All areas are in play. First Base Side: * Through the opening between the backstop and the first base team area. *Into the first base team area. * Over an out-of-play line from the end of the first base fence, along the Asphalt Walkway past the Light Tower to the fence on Moscone #2. The Playing Field farthest from the Clubhouse, Bay & Laguna St.
Backstop: All areas are in play. Note: Bats may be placed in front of the closed ends of both team areas.and bats may be placed in front of the closed ends of both team areas. Third Base Side: * Into the third base team area, including the back fence directly above it. * Over an out-of-play line from the third base fence, past the left field light tower and uphill to the Asphalt Walkway. Left field: *Along the inside edge of the Asphalt Walkway to the Moscone #1 fence. First Base Side: * Into the first base team area, including the back fence directly above it. * Through the Gate beyond first base team area. The Playing Field nearest the Clubhouse. Third Base Side: * Over an out-of-play line from the backstop fence past the team area and diagonal to the Moscone #4 first base foul line to a point of termination beyond Moscone #4 home plate. Any ball going beyond this point and remaining inside the Baseball field (Moscone #4) is in play. Right field: *Extend Clubhouse fence straight down to Moscone #1. First Base Side: * Over an out-of-play line from the end of the backstop fence directly to the Clubhouse fence. Third base side: Extend the end of the backstop with an imaginary line parallel with the third base foul line all the way down. Any ball going over to the left of this imaginary line is out-of-play. Left field: All concrete areas and trees are out-of-play. On a fair batted fly ball is a home run. On a bounce or roll is a two-base award. This is for all adult softball games. For Middle and High Schools, anytime the ball reaches the trees or concrete areas is a home run or four-base award. Center field: All grass areas before the concrete walkway or the building are in play. A fair batted fly ball hitting the trees or the concrete walkway is a home run. On a bounce or roll, it is a two-base award. Right field: Over the children’s playground fence is an out for all adult softball games if there are any children playing in it. If no children are playing at the start of game time, this can be a ground rule double for all adult softball games. For Middle and High Schools, this a home run. A fair batted fly hitting the overhanging tree branches by the fence is live and cannot be caught for an out. Any ball hitting the tree branches and going over the fence is a ground rule double for all adult softball games. For Middle and High Schools, a fair batted fly ball hitting the tree branches above the fence line and going over is a home run. A fair batted fly ball hitting the tree branches below the fence line and going over the fence is a ground rule double. First base side: Extend the end of the backstop with an imaginary line parallel with the first base foul line all the way down. Any ball going over to the right of this imaginary line is out-of-play. The Playing Field farthest from the Clubhouse. Backstop: All areas are in play. Note: Bats may be placed in front of the closed end of the first base team area. Third Base Side: * Through the opening between the backstop and the third base team area. * Into the third base team area or stands. * Over an out-of-play line extended from the third base fence to the telephone pole beyond the corner gate. Left field: * Into the covered Mulch area. The Tarp (if present) covering this area is out-of-play. *Into the area between the Shed and the end of the first base fence from Rolph #2. The face of the Shed is live and in play. A fly ball on top of the Shed or over the first base fence is a home run. *A fair batted ball remaining out of sight in the Shrubbery along Cesar Chavez (Army) or Hampshire Street fence. * Onto the roof of the Shed in left center field (the face of this shed is alive and in play) and/or into the trees or fence directly behind it. A fly is a home run, and a bounce or roll is a two-base award. Center field: * Through either opening between the backstop and the team area on Rolph #2 is a four-base award. (All areas within the playing Field on Rolph #2 are in play). *Onto the Asphalt Walkway, including behind the Rolph #2 third base fence. A fly is a home run. A bounce or roll is a two-base award. Right field: * Onto or beyond the Asphalt Walk. A fly is a home run. A bounce or a roll is a two-base award. First Base Side: * Into the first base team area, including the back fence directly above it. *Into the lined out area from the end of the first base fence Black Netting Pole (approximately 10′). Trees within the Field: see General Rule 12. Third Base Side: * Through the gap between the backstop and the Control Box adjacent to the third base team area. * Into the third base team area. * Onto the Asphalt Walk along the left field foul line.Left field: * Through the gap in the middle of the left field fence. This is a two-base award. * Through the Gate in left-center field. This is a two-base award. * A ball remaining out of sight in the tall grass along the Potrero Avenue Fence. This is a two-base award. 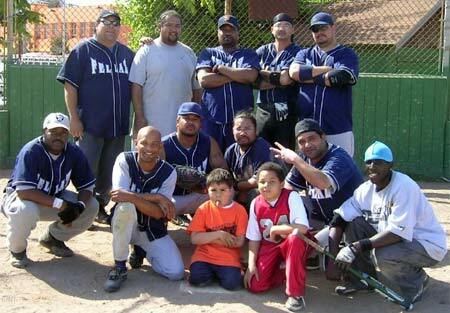 Center field: All areas inside the Caesar Chavez (Army) Street and Potrero Avenue Fences are in play. Right field: * A ball remaining out of sight in the shrubbery along the Caesar Chavez (Army) Street Fence. This is a two-base award. First Base Side: * Through the openings to the first base team area. * Into the lined-out area around the Valve Box behind the first base fence and up to and including the side of the Shed ( the face of the Shed, parallel to the foul line, is alive and is in play). * Into the tree line along the right field foul line. * Through the Gate in the right field corner. Third base side: Extend the end of the backstop with an imaginary line to the front of the bench. Any ball to the left of this imaginary line or hitting the bench area is a dead ball. At the end of the third base bench extend an imaginary line straight out parallel with the third base foul line all the way out. Any ball going past to left of this imaginary line is out-of-play. Right field: All areas are in play. A fair batted fly ball over the fence is a home run starting 6 panels on and to the left from the first base foul line. A fair batted fly ball over the fence to the right of the 6th panel is a ground rule double. First base side: Extend an imaginary line from the end of the backstop parallel with the first base foul line all the way out. Third base side: Extend an imaginary line from the end of the third base fence parallel with the third base foul line straight out all the way down. (This is approximately one to two feet in front of the left field fence). Any ball going to the left into the dugout/bleacher area is out-of-play. Left field: All areas are in play. Any ball reaching the concrete walkway is a home run or four-base-award. Right field: All areas are in play. A ball reaching the concrete walkway in right center field is a home run or four-base award. First base side: Extend an imaginary line from the end of the first base fence parallel with the first base foul line all the way out. Any ball going over to the right of this imaginary line is out-of-play. The Playing Field with the permanent concrete stands. Third base side: *Through the gate of the third base side team area. There is no award if this gate is left open by the offensive team. *Any fair fair batted ball into the Soccer goals is a two-base award. (A fair batted ball striking and rebounding off the Soccer post/frame is live and in play). *Through any opening along the third base side. Left field: *Through the opening of the fence nearest the third base foul line is a two-base award. Bouncing over the fence is a two-base award. *Through other fence openings in left or left center is a four-base award. Center field: *Steps and Concrete Walkway or into Soccer goal in this area is a four base award. Right field: *Into the first base team area on Silver Terrace #2 is a fur-base award. *Through the fence opening down the right field foul line. First base side: Through the gate of the first base side team area. There is no award if this gate is left open by the offensive team. Asterisk(*) indicates Out-of-Play – Apply ASA rules unless otherwise indicated. The playing field next to the tennis courts. Backstop: All area are in play. Left field: *From the end of the third base fence along the shrubbery all the way down the line. Center field: *Any ball hit to the parking lot is a home run. Right field: *Into the shrubbery is a home run. All other grass areas are in play. *Onto the concrete walkway along right field and the first base fence. First base side: *Through the opening between the backstop and the first base team area. *Into the first base team area. The Playing Field adjacent to the Water Treatment Facility. Third base side: *Through the opening between the backstop and the third base team area. *Into the third base team area. Left field: *From the end of the third base fence diagonally to the second Light Tower, including the Scoreboard. Center field: *Into the tree stumps or shrubbery: On a fly ball is a home run. On a bounce or roll is a two-base award. Right Field: *Over the fence on a fly ball is a home run, on a bounce is a two-base award. *Onto the concrete stairway. First base side: *Through the opening between the backstop and the first base team area. *Into the first base team area. *90 degrees straight back from the end of the first base fence. The Upper Level Playing Field. Out of Play (*) Apply ASA Rules unless otherwise stated. Third Base Side: * Onto the top of the Concrete Pad upon which the fenced-in team area is located, except for the concrete directly in front of the fence (in the gutter, off the face of the concrete and off the front of the team area fence are all in play). *Into the Drain in the left field corner. * Onto the Concrete Access Pad in front of the Gate, and off or through the Gate in the left field corner. Center field: * Through the opening in deep center. This is a two-base award. Right field: * Over the right field fence: a fair fly over this fence to the right of the Light Tower is 2-bases in Women’s BB/B division only. First Base Side: * Onto the top of the Concrete Pad upon which the fenced-in team area is located, except for the concrete directly in front of the fence (in the gutter off the face of the concrete and off the front of the team area fence are all in play). * Onto the Concrete Ramp behind first base including its railing and its concrete support (the Concrete Access sticking out of from the Curb is in play). * Into the lined-out area behind first base. * Into and remaining in the space behind the Concrete Gutter and Adjacent to the fence along the right field foul line. Note: This field is presently authorized for Women’s Slow Pitch only. If the tree or light pole is located inside the park…If the ball hits the tree / light pole above the fence line and does not go over the fence, and in the umpires’ judgment, if it weren’t for the tree, the ball would have gone over, it is ruled a four (4) base award and does not count as one over the fence. If the ball hits the tree / light pole above the fence line and goes over, it is ruled a HOME RUN, one over the fence. If the ball hits the tree / light pole below the fence line and stays in, the ball is LIVE! If the ball hits the tree and goes over the fence but in the umpires’ judgment, if it weren’t for the tree, it would not have gone over, it is ruled a ground-rule double. This would not count as one over the fence. If the ball hits the tree / light pole outside the park and comes back in, it is ruled a HOME RUN, one over the fence. In all cases…if the ball is tipped off the outfielder’s glove and goes over the fence, it is ruled a four (4) base award and does not count as a home run over the fence.